New and Improved! 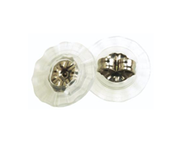 A package of 25 additional Medical Plastic Earring Backs. The Medical Plastic Backs will only fit medical plastic earrings, not titanium earrings. These are not ear piercing stud backs. - the earring back’s placement on the post is adjustable - it has 4 clicking positions. One can hear a clear click when the earring back clicks into different positions. - the earring back encapsulates the tip of the post in all but one position (when it is at its tightest). TIP: Rinse medical plastic earrings with gentle soap and water. Body oils or certain products like conditioner and sunscreen can cause plastic to become slippery. Rinsing the earrings free of body oils and certain product will help the earrings and earring backs maintain friction.